Guard of the Year: Qian-Hui Xu (171-G/F-89) of Chunghua T.
Forward of the Year: Hsiang-Ting Huang (180-F-93) of Chunghua T.
G/F: Qian-Hui Xu (171-G/F-89) of Chunghua T.
G: Hsiao-Tong Peng (168-G-98) of Taiyuan T.
F: Hsiang-Ting Huang (180-F-93) of Chunghua T.
Cathay Life celebrated WSBL title. They swept Chunghua to defend the trophy. The game was mostly controlled by Cathay Life. Chunghwa Telecom was better in third quarter 21-8. But it was not enough to take a lead and get a victory that evening. The game was decided in the last minutes when Cathay Life won last quarter 27-17. They dominated down low during the game scoring 54 of its points in the paint compared to Chunghwa Telecom's 30. They outrebounded Chunghwa Telecom 54-37 including 39 on the defensive glass. Cathay Life players were unselfish on offense dishing 22 assists. They brought some defensive toughness making 12 blocks. The former international forward Yu-Ting Lin (183-94) had a double-double by scoring 23 points, 11 rebounds and 6 assists to lead the charge for the winners and international center Wei-An Chen (177-95) chipped in 23 points and 7 rebounds during the contest. Cathay Life's coach Hui Zheng allowed to play the deep bench players saving starting five for next games. The former international swingman Qian-Hui Xu (171-89) responded with a double-double by scoring 15 points, 16 rebounds and 5 assists and international forward Hsiang-Ting Huang (180-93) produced a double-double by scoring 10 points and 10 rebounds. Taiyuan defeated Taipower to clinch the Bronze medals. The former international power forward Jun-Yi Liu (180-81) orchestrated the victory by scoring 20 points and 8 rebounds. The former international center Pei-Chen Tsai (186-84) contributed with a double-double by scoring 15 points and 10 rebounds for the winners. Forward Yi-Jun Lin (165-91) replied with 14 points and 7 rebounds and forward Xin-Yu Lai (175-88) added 11 points, 6 rebounds and 4 assists in the effort for Taipower. Taipower's coach Ji-zhen Lin rotated ten players in this game, but that didn't help. International Guard Yi-Xiu Zheng (178-G-93) had a very impressive game in the last round for league's leader Cathay Life and that's her to receive a Interperformances Player of the Week award for round 15. The 25-year old guard had the game-high 14 points adding six rebounds and four assists for Cathay Life in her team's victory, helping them to crush Chunghua T. (#2, 9-6) with 19-point margin 85-66. The game was between two of the league's top four teams. It allowed Cathay Life to consolidate first place in the Taiwanese WSBL. They maintain a perfect record without any lost game in the league. The season is already in a full swing and Cathay Life still have not lost a single game, getting all 15 victories. Zheng has many years of experience at Cathay Life, through which she has constantly improved. Zheng has impressive league stats. She is in league's top in points (8th best: 10.5ppg), rebounds (7th best: 5.6rpg) and averages solid 56.0% FGP. The second most remarkable performance in last round's games was another Cathay Life's star - 23-year old international forward Ya-En Han (180-F-95). Han impressed basketball fans with 8 points, 11 rebounds and 6 assists. Of course together with Zheng she helped Cathay Life with another comfortable win 85-66 over slightly lower-ranked Chunghua T. (#2, 9-6) being unquestionably team leader. It was definitely game of the week between two contenders to the title. Cathay Life consolidated its place in the very top position of the standings. She plays for the best team in the league and Cathay Life managed to win all 15 games keeping a perfect record. Han is one of the most experienced players at Cathay Life and similarly like Yi-Xiu Zheng has a reputation of one of team's most reliable players. 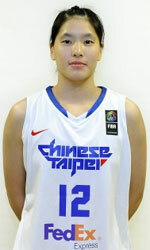 The third best performed player last round was former international swingman Qian-Hui Xu (171-G/F-89) of second-ranked Chunghua T.. Xu showcased her all-around game by recording 10 points, five rebounds and five assists in the last round. Despite Xu's great performance Chunghua T. lost 66-85 to #1 ranked Cathay Life. But her team cannot count on just a single player as she also needs help of the other teammates especially in such crucial game. The last thing Chunghua T. needs is to lose another game like this one. They lose more and more distance to the top teams. Their record is 9 victories and 6 lost games. Xu has a great season in Taiwan. After 15 games, she made it on the list of the league's leaders in rebounds with 5.9rpg (5th best) and assists with 3.7apg (7th best).